Final call! All ashore that’s going ashore! 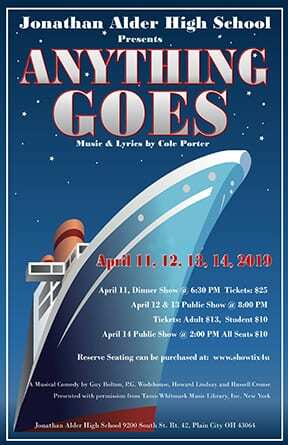 This week, Jonathan Alder High School is presenting four performances of “Anything Goes.” The musical follows nightclub dancer and evangelist, Reno Sweeney (played by Aubrey Wright), who sets sail from New York to England on the S.S. American. Meanwhile, Billy Crocker (John Coffey), Reno’s long-time friend, sneaks onboard the ship to find the girl of his dreams, Hope Harcourt (Sydney Winslow). A problem arises when Billy realizes Hope is arranged to marry Lord Evelyn Oakleigh (Liam Tillyer). Joining them on board is Public Enemy #13, Moonface Martin (Nehemiah Haines), and his crazy sidekick, Erma (Gabby Pollom). With Reno’s help, Billy may have a chance to win Hope’s heart.